Imerslund-Grasbeck Syndrome (IGS) is a rare inherited disorder characterized by megaloblastic anemia due to a selective Vitamin B12 malabsorption in association with mild proteinuria. This syndrome can be diagnosed and treated easily. Herein, we describe a child with IGS as a rare etiology of growth retardation with diarrhea, vomiting and proteinuria. 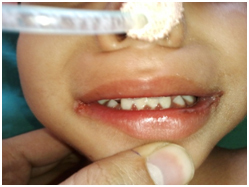 A 20 month-old female child was admitted with dia­rrhea, vomiting, recurrent apthous-stomatitis and growth retardation.The child was born out of a third degree consanguineous marriage. She was the youngest of three female children, siblings being healthy. On examination had grade 2 PEM as per IAP classification with pallor, cheilitis and glossitis (Figure 2). Multiple ecchymotic patches were present in the knuckles and periumbilical area (Figure 1). Liver was palpable 2.5 cm below the right costal margin, with span of 7 cm. Complete blood count and peripheral blood smear examination revealed a normocytic normochromic to microcytic hypochromic anaemia with mild anisopoikilocytosis. Haemoglobin was 8.8 gm% (low), RBC indices were normal, rdw was elevated to 21.3. There was also leucopoenia with TLC of 4200 cells/cubic mm and thrombocytopenia with platelet count 46,000/cubic mm. Bone marrow aspiration revealed dimorphic anaemia- cellular marrow with myeloid:erythroid of 1:1. Erythropoiesis –increased in number with megaloblastic to normoblastic maturation, macro normoblasts seen. Leukopoiesis – increased in number, with all stages of maturation, dyspoietic forms, giant metamyelocytes and band forms seen. Megakaryocytes increased in number. Serum iron, TIBC and ferritin were normal. No parasites were found on stool examination. USG abdomen and gastrograffin follow through study were found to be normal .Serum vitamin B12 level were 88.96 pg/ml (normal: 191-663) suggestive of deficiency. Folic acid levels were normal. A 24-hr urine collection showed an abnormal excretion of protein at 200 mg/dl and the urinalysis showed 2+ proteins. Parents when evaluated did not show any features of Vitamin B12 deficiency. Child was treated with antibiotics and started on a high daily dose of vitamin B12 of 1000 µg IM and the treatment continued with 100µgr weekly/ IM, following which there was dramatic response. This report presents a rare syndrome named Imerslund-Grasbeck as a cause of growth re­tardation and recurrent infections in an infant and highlights the great importance of early diagnosis and initiation of Vit B12 treatment. This syndrome has been well described in chil­dren originating from Scandinavian countries, Israel and Turkey . Although the studies from Scandinavian countries give an estimated pre­valence of <6:1,000,000 , the exact prevalence is not known because of missed diagnosis. The pathogenesis of vitamin B12 malabsorption in this syndrome remains unknown. In one study, the uptake of IF-B12 complex in vitro by homogenized ileal biopsy specimens from one patient was found to be normal and it was therefore postulated that the defect lay at a later stage after the attachment of the IF-B12 complex to the surface of the ileal cell . In another detailed study of two brothers with the syndrome, IF-B 2% uptake in the ileum in vivo was examined by sub cellular fractionation of ileal biopsy specimens . No uptake of vitamin B12 was detected in the ileal tissue . The presence of megaloblastic anemia in children should be followed by investigation of proteinuria, due to the existence of this rare disorder that has a simple diagnosis and an effective treatment. Anemia and proteinuria were determined in our patient from the clinical findings of pallor, weakness, weight loss, abdominal pain, glossitis and vomiting together with the laboratory results. The applied treatment resulted in the correction of the clinical and laboratory findings. Vitamin B12 deficiency is a well-known cause of recurrent aphthous stomatitis, although the mechanism by which this deficiency causes the stomatitis is not well understood . Broides et al. demonstrated that serum vitamin B12 deficiency is associated with a neutrophil chemotactic defect and recurrent aphthous stomatitis in Imerslund-Grasbeck patients. They reported 3 infants with vitamin B12 deficiency due to Imerslund-Grasbeck, who presented with borderline or normal hemoglobin concentrations, recurrent aphthous stomatitis, and a neutrophil function defect. Vitamin B12 therapy led to an immediate resolution of aphthous stomatitis and full correction of neutrophil function . In our case, the serum folate level was normal. Barium studies were done to exclude other causes of malabsorption, which proved to be normal. She was treated with a course of antibiotics that would eliminate the chances of deﬁciency states due to bacterial overgrowth. Radiocobalamin absorption studies to exclude pernicious anemia however, could not be done due to constraints of availability and economy in our set up. Despite these constraints, the symptoms of megaloblastic anemia, reduced vitamin B12 levels and persistent proteinuria together with a dramatic response to parenteral therapy strongly suggests this rare diagnosis. To conclude, Imerslund Grasbeck Syndrome, a rare diagnosis should always be suspected in a child with pallor, reduced vitamin B12 levels and persistent proteinuria in the absence of any renal impairment. This rare disorder has a simple and effective treatment to avoid the devastating neurological sequelae. ©2015 Kiran B. This is an open-access article distributed under the terms of the Creative Commons Attribution License, which permits unrestricted use, distribution, and reproduction in any medium, provided the original author and source are credited. Department of Pediatrics, Kasturba Medical College, Manipal University, Mangalore, India.